Astronauts Terry Virts and Barry Wilmore will make the third spacewalk Sunday to complete the first in a series of work to outfit the International Space Station with the mechanisms needed for Commercial Crew spacecraft to dock to the orbiting laboratory. The two adapters were built by Boeing and will be carried to the station on upcoming SpaceX cargo missions. The adapters will serve the Boeing CST-100 and SpaceX Crew Dragon spacecraft when they fly astronauts to the station. During Sunday’s spacewalk, Virts and Wilmore will deploy 400 feet of cable along the truss of the station and install antennas as part of the new Common Communications for Visiting Vehicles system that will provide rendezvous and navigational data to visiting vehicles approaching the station, including the new U.S. commercial crew vehicles. 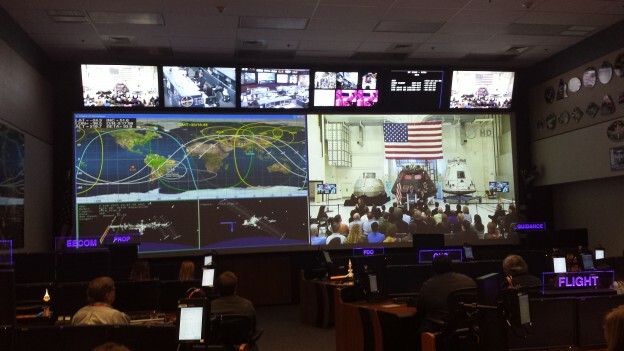 NASA TV coverage Sunday will begin at 6 a.m. EST. The spacewalk will begin around 7:10 a.m. and is expected to last about 6 hours, 45 minutes. NASA TV is available online at https://www.nasa.gov/nasatv. Author Steven SiceloffPosted on February 27, 2015 Categories Boeing, CCtCap, Commercial Spaceflight, General, International Space Station, NASA, SpaceX1 Comment on Commercial Crew Bookmarks are Here! Safety engineer Billy Stover is part of the NASA team making the new generation of commercial spacecraft safe. He will use the same determination and open-minded approach as he supports the Brevard County School Board make the best capital improvements to the school system. 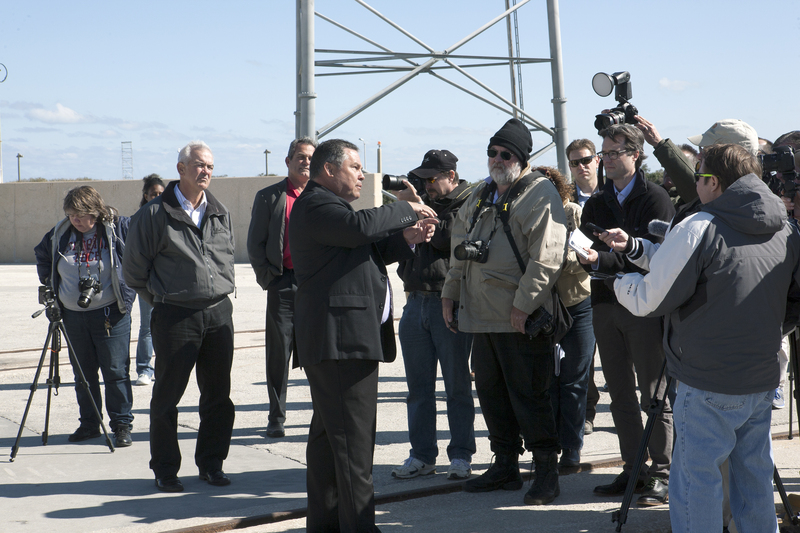 Howard Biegler, Launch Operations lead of Human Launch Services for United Launch Alliance, shows members of news media the area at Space Launch Complex 41 where the Commercial Crew Access Tower will be built. The 200-foot-tall structure is designed to provide safe access by flight and ground crews to the Boeing CST-100 spacecraft at the pad. 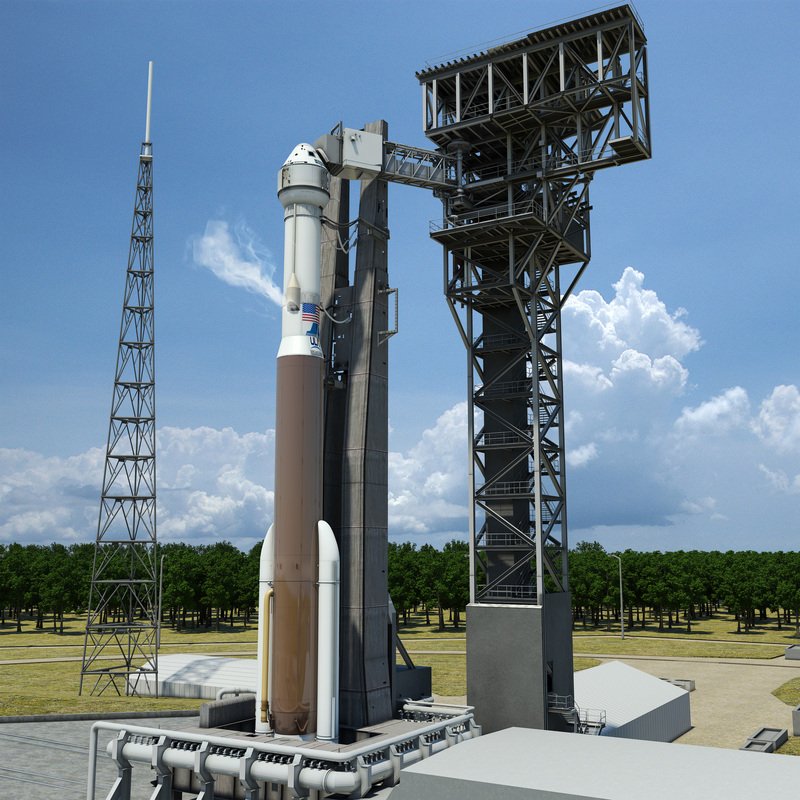 The tower will be built between launches of the ULA Atlas V rocket on other missions. Officials take part in the formal groundbreaking at Space Launch Complex 41 where the Commercial Crew Access Tower will be built. The 200-foot-tall structure is designed to provide safe access for flight and ground crews to the Boeing CST-100 spacecraft at the pad. The tower will be built between launches of the ULA Atlas V rocket on other missions. 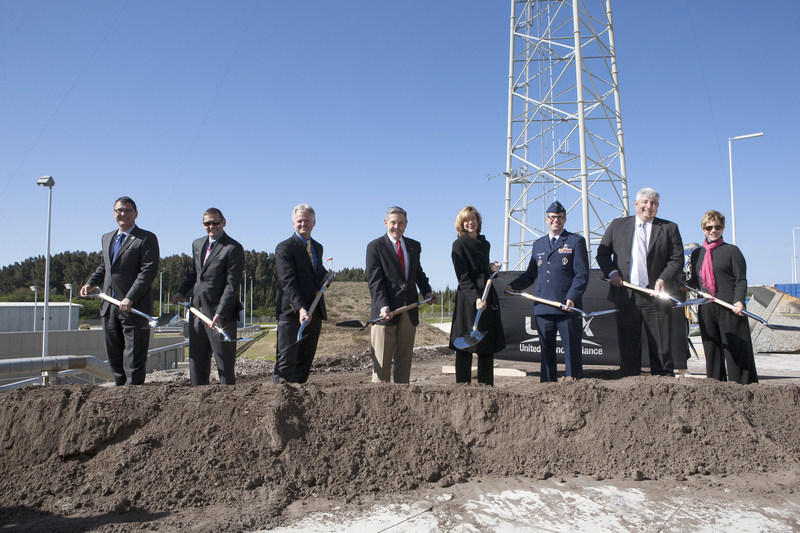 The participants in the groundbreaking are, from left, John Mulholland, vice president of Boeing commercial programs, John Elbon, Boeing vice president and general manager of Space Exploration, Jim Sponnick, vice president of Atlas and Delta programs for ULA, Bob Cabana, director of NASA’s Kennedy Space Center, Kathy Lueders, manager of NASA’s Commercial Crew Program, Col. Shawn Fairhurst, vice commander of the U.S. Air Force’s 45th Space Wing, Jim Kuzma, chief operating officer of Space Florida and Lynda Weatherman, president and chief executive officer of the Economic Development Commission of Florida’s Space Coast. A set of three spacewalks by astronauts on the International Space Station will focus on preparing the orbiting laboratory for the arrival in coming years of spacecraft under development by partners of NASA’s Commercial Crew Program. Astronauts Barry Whitmore and Terry Virts will perform the extravehicular activities, or EVAs, on Saturday, Wednesday and Sunday, March 1. The spacewalkers will prepare two of the ports on the station to receive two docking adapters that are compatible with the hatches of Boeing’s CST-100 and the SpaceX Crew Dragon. Those two spacecraft are scheduled to be built and flight-tested then certified in 2017 leading up to operational missions to take astronauts to the station. 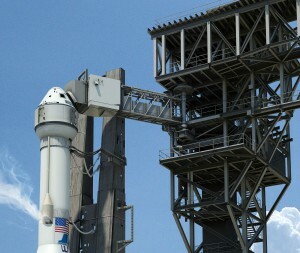 Boeing built the adapters, and a cargo-only version of the SpaceX Dragon will be used to take them to the station later this year. In addition to regaining America’s ability to launch astronauts to the station from U.S. soil, the new spacecraft will expand the crew of the station to seven people, which will double the amount of time astronauts can devote to research work on the station. Spacewalks are complicated endeavors calling for detailed choreography and careful planning. You can learn more about the spacewalks and everything involved with achieving the objectives in this briefing from earlier this week. Boeing and United Launch Alliance (ULA) will mark the start of construction of the Commercial Crew access tower at Space Launch Complex 41(SLC-41) on Cape Canaveral Air Force Station, Florida at 2:30 p.m. EST Friday, Feb. 20. 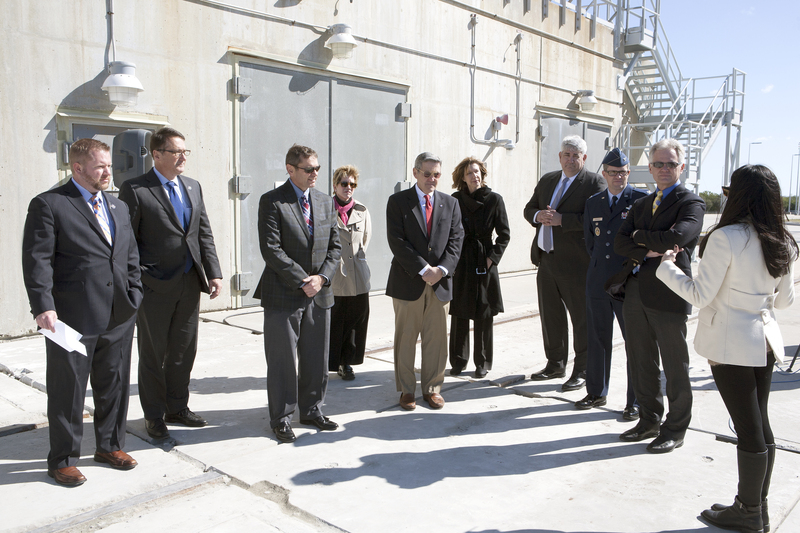 Media are invited to tour operations and attend the formal groundbreaking event. 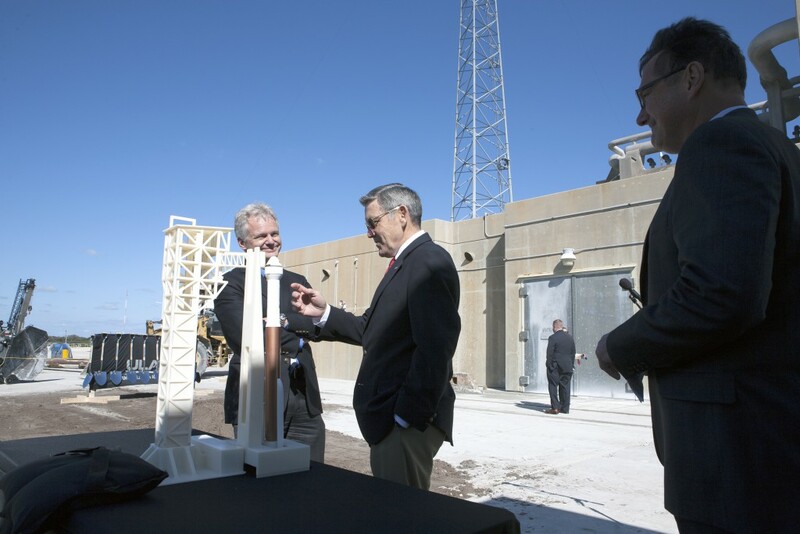 The new crew access tower at SLC-41 will reach 200 feet in height and include an elevator, as well as means for quick evacuation from the structure in the event of an emergency. SLC-41 is one of the most active launch complexes on the Space Coast, so construction of this tower is scheduled to take place between launches, with segments of the structure being built off-site then assembled at the pad. Under a Commercial Crew Transportation Capability (CCtCap) contract with NASA, Boeing’s Crew Space Transportation (CST)-100 spacecraft, currently in development, will be certified by NASA’s Commercial Crew Program to fly crews to and from the International Space Station. 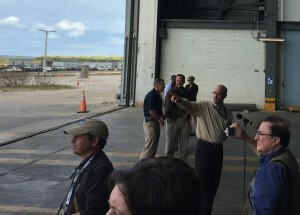 The spacecraft will launch on a ULA Atlas V rocket from SLC-41.